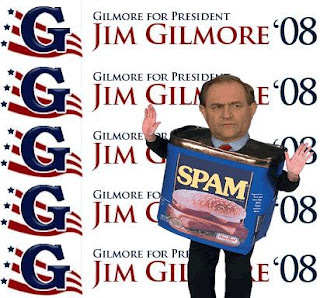 Lost in a field of 10 Republican Prez-wannabees, Mr. Gilmore would have been completely unknown to me if he didn't spam my blog mail at least once a week. Yeah, that's how you get on my good side; I click the Yahoo SPAM button every time, and he keeps coming back. Methinx you gotta pay for a feature like that...why doesn't he just save up for a TV commercial? At least he hasn't gotten on the news for saying something controversial/stupid.